One of the things I have discovered since going gluten free is that wheat is hiding in just about any packaged food you can buy – breads, pastas, cereals, granola bars, sausages, soy sauce… the list goes on, whether wheat is an actual ingredient or the food is cross-contaminated (because it was processed in a factory that handles wheat). Those of us trying to avoid eating wheat (and gluten) are pretty limited when it comes to buying prepared foods, especially when travelling and we need to pick up a quick snack or eat out at a restaurant. And, try as we might, there are just some things we gluten free chefs cannot recreate without the magic of wheat flour – crusty baguettes, airy pastries, or chewy pizzas. However, with a little creativity and experimentation, and armed with a bag of trusty gluten free flour, many wheat-filled recipes can easily be transformed into a gluten-free-friendly version. 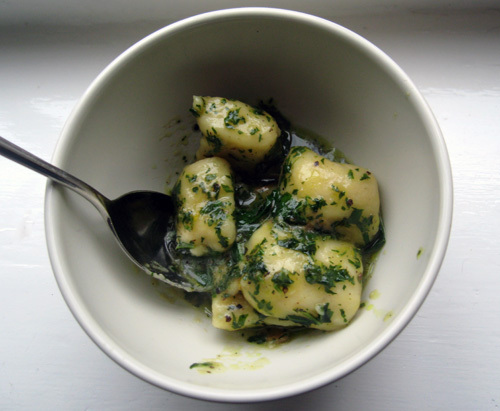 One such food: gnocchi. This potato-based pasta is a great base for your favorite pasta sauces, and is incredibly warming and filling. Traditionally, gnocchi is made with wheat flour, something I didn’t discover until I had to start reading ingredient labels. 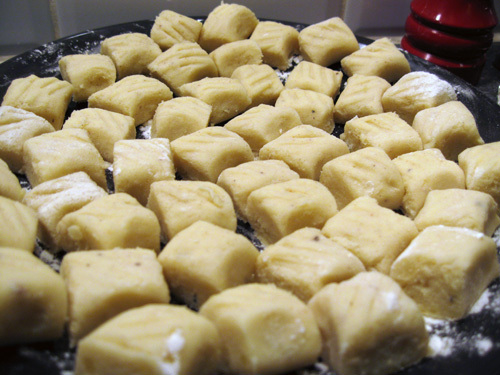 But, gnocchi is the perfect example of a food that does not necessarily need to be made with wheat flour; all-purpose gluten free flour mixes are easily substituted in the recipe – whether you make your own gluten free flour mix at home, or buy a ready-made version, like Dove Farms Gluten Free White Flour. Making gnocchi dough takes a little getting used to – if your first batch isn’t perfect, mush it all together again, and try again by adding a little more flour or water until you reach the right consistency. 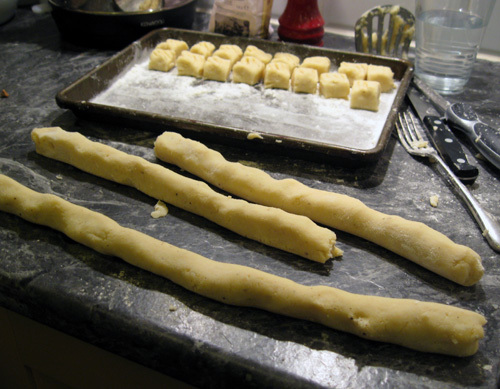 It’s a delicate balance: you want the dough to be dry, yet too much flour makes the gnocchi gummy and too heavy. Baking the potatoes (instead of boiling) yields a dryer potato, which helps you get a nice dry dough. Once you get the feel for making gnocchi dough, it’s worth making a double batch and freezing the leftovers – gnocchi is a great last-minute yet tasty meal on days when you don’t feel like spending much time cooking. 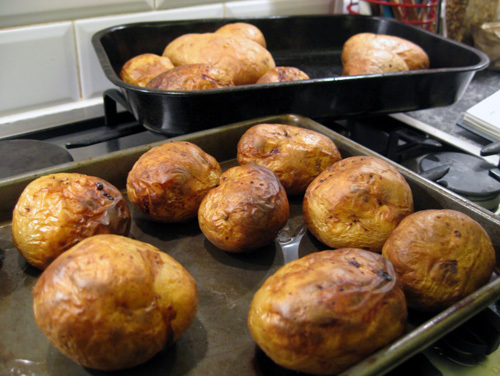 Preheat the oven to 220 C/425 F. Scrub your potatoes, then rub then with olive oil and prick them with a fork. Lay them on a roasting tray and bake for 1 hour, until crispy on the outside and dry and fluffy on the inside. Let the potatoes cool for a few minutes, then scoop the insides out of the skins and into a mixing bowl. Now it’s time to mash the potatoes – the goal is to create very smooth mashed potatoes. You have a few options, depending on your kitchen equipment – if you have a ricer, then rice your potatoes. If you don’t have a ricer, you can press the potatoes through a sieve, or mash very well with a potato masher. Add in the nutmeg, salt, some ground pepper and the egg yolk. Throw in a handful of flour, and mix everything together by kneading it with your hands – you want to have a dry, doughy consistency. If the dough is too wet (it probably will be), then add one handful of flour at a time to the dough until you reach the desired consistency; if they dough is too dry, add a little bit of water. If you are unsure if your dough is right, take a little piece and cook it in some boiling water – if it falls apart, you need more flour in the dough. Flour a clean section of kitchen counter. Take a large handful of dough and use the palms of your hand to roll it into a tube the thickness of a sausage – the same technique you use to make snake out of play dough! If you want to get fancy, you can press the tines of a fork onto the top of the gnocchi snake. Cut each tube into 2.5cm/1inch pieces. Place the pieces on a tray sprinkled liberally with flour or cornmeal, and set in the fridge for 20 minutes. 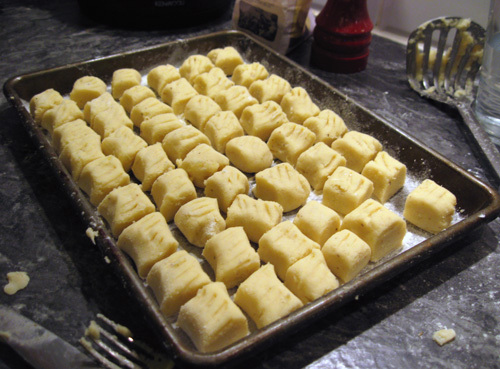 To cook your gnocchi, boil some water in a large pot – you want the gnocchi to have room to move around. Cook the gnocchi for approximately 4 minutes, until they float. Drain gently. Remember, it is very filling so plan your portions accordingly! One day we didn’t have much food in the house, so Gary whipped up a last-minute sauce for our gnocchi, using some leftover ingredients that we had in the fridge… Amazing! Take your rocket and basil, scrunch it up, and chop finely. In a pan, heat a little olive oil, and fry up the garlic. Add the rocket and basil and let it sizzle lightly. Add a nob of butter, a little stock, and a good grating of parmesan until the sauces becomes shiny but loose. Stir in your gnocchi and carefully combine with the sauce. Add a little salt and pepper and zest of lemon to finish.